Flex those culinary muscles with this cooking set made to work with the Uuni Pro Multi-Fuel Outdoor Oven. 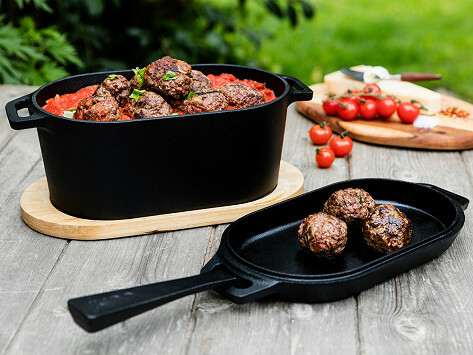 The sizzler pan and deep casserole dish are both made from super-tough cast iron, and a removable handle can be used on both pieces. The wooden base fits both as well, and works as a trivet for dishes that come straight out of the oven. Sizzler pan: Inner: 9.8" x 5.1" x 1.2"; Outer: 12.4" x 6.3" x 1.4"
Casserole dish: Inner: 10" x 6" x 4.1"; Outer: 12.4" x 6.3" x 4.3"